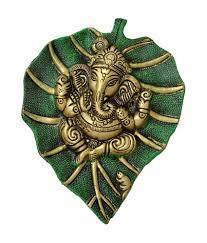 The Lord Ganesha sculpture on the green pan shape leaf. You can decorate your home, office wall with this decorative products of craftsmirchi and make you different from other. This Product is made up of white metal. Online handicrafts items store serving the antique gift and decorative items as your doorstep. We are serving Indian hand made handicrafts items at reasonable prices. Buy online handicrafts Items,White Metal Items,Brass Items,Glass Items,Antique Items with CraftsMirchi. CraftsMirchi is a online store to buy handmade handicrafts items on best prices in market. CraftsMirchi serves 1000+ handicrafts items. We are assure you to best prices in India.